Come play Spin the Globe with us! 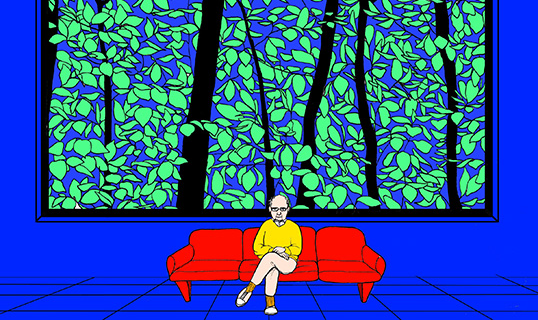 Noemi Schneider’s Life as Trauma introduces us to Binjamin Wilkomirski, the author of a fabricated Holocaust memoir, and hence a man who has never existed. In Orshina, Hanit Guli’s poignant drama, a promise to the family is revealed to be empty when, all packed up, the father remembers he has no address to provide the movers. And in Mercè Rodoreda’s Aloma, remembrance of childhood loss punctuates a woman’s mundane existence, just as Ah-reum Han’s tribute to Kerascoët’s “dazzling, ruthless worlds” is interwoven with the mourning for a deceased teacher. While Samudra Neelima’s narrator plants “black seeds” in order to grow a “beloved black tree,” Alejandro Albarrán desires to “write the amputation”—both poets sketch writing’s failure, but, through performing failure, succeed. I have always been troubled by the hegemonic position of English. N Kalyan Raman, a bilingual translator, is best known for his English translations of the works of eminent Tamil modernist writer Ashokamitran. Suchitra Ramachandran, a young translator who won the Asymptote Close Approximations translation fiction prize in 2017 for her translation of the Tamil short story “Periyamma’s Words” by B. Jeyamohan, works in the same languages. The two translators met in Chennai, the capital city of Tamil Nadu and home of the Tamil language, to discuss the practice and politics of translation, posing questions as wide ranging as: What is the role of translation in an astoundingly multi-lingual country? Does English as a language, a post-colonial residue, oppress or enable? What is the literary legacy of translation and how can it shape the understanding of a diverse society? What follows is an edited excerpt of their conversation. For other emerging translators, enter the fourth edition of our translation contest and stand to win up to $3,000 in prizes. This year’s competition is judged by Edward Gauvin and Eugene Ostashevsky. Details here. 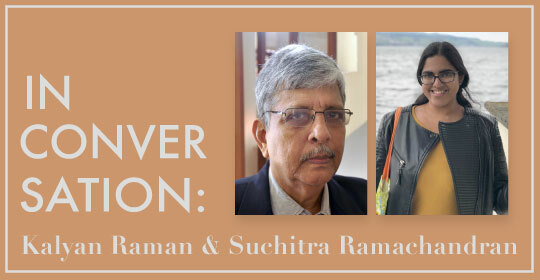 Suchitra Ramachandran (SR): Translation—a weighty literary activity, a difficult craft—seems to have no prestige associated with it in India. And that’s a reason, I think, why a lot of people don’t pursue it seriously. N Kalyan Raman (KN): The translator is marginalized as a matter of course and for no good reason. A senior editor in Delhi told me that there is simply no space available in the media to talk about translators. What we must do first is accept the translator as part of the literary community, as producers of literary texts. Editors and other institutional intermediaries are given far more space in the translation discourse than translators themselves. Also, I don’t think of translation as one separate trick. It’s as much a part of the literary culture as anything else. And translators do other things (in the literary ecosystem) as well, which hardly receive any notice—reflecting, engaging, reviewing, it is all a part of the culture. And understanding it, developing a reflective awareness of the trajectory of the literary culture of your community. Languages imply community above all else. What good is language if there is no community around it? In India, the English language seems to facilitate, in any field, only interest groups. It’s not amenable to a truly open space. I felt that manners were nothing more than knowing to say the appropriate English words at the right times. Come, go, stop, food, clothes, son, daughter, road, house, sky, earth, night, day—these words came rather easily to her. If I said those words in Tamil, Periyamma would reply with the corresponding English words. It was only when Periyamma jumped to say ‘cat’ before I could say poo– that I realized I was quizzing her in order. So I changed the order. But then Periyamma started saying the English words just by looking at my eyes. So I pointed at different animals and asked what they were. Periyamma said naai, poonai, kozhi in Tamil and then translated them—‘dog,’ ‘cat,’ ‘hen.’ It was only after Periyamma had mastered a hundred basic words—she would say them even before I could ask—that I moved on to concepts. That was when all hell broke loose. Periyamma was not my periy-amma, big-mother, a name usually reserved for one’s maternal aunt. But everybody in our town called her that. Her house, they called the Big House. Situated in the town centre, that bungalow was built by Periyamma’s grandfather Thiruvadiya Pillai a hundred and fifty years ago. The word about town is that when it was built, the glass for the house sailed in from Belgium, the teak came from Burma, the marble from Italy, and the iron from England. The people who came to grind limestone for its walls stayed on permanently in our town, and as a result our town acquired a Lime Street. Our carpenters also moved in during that period. Periyamma’s wedding took place in that bungalow. That was the first time a mottaar came to our town. The newlyweds were paraded about town in that Ford motor car. Periyamma was not to step foot into that car ever again. It has been forty years since Periyamma’s husband passed away. Her only son Arumugam Pillai had been a lawyer in Madurai, and he died there. His four sons were variously placed in Chennai and Delhi and Calcutta. None of them are alive now. A daughter of the oldest grandson is a doctor in America. She is the only person who has some semblance of a relationship to Periyamma. Periyamma went on living in that town, an ancient relic in the eyes of its fourth-generation inhabitants. In the olden days their family had six thousand acres of land to their name. Over the years, it had shrunk in various ways to a hundred acres. Those hundred acres had been neatly partitioned and sold over thirty years ago. In the end, all that was left over for Periyamma was that house, two acres of land around it, a good sum in the bank, and her jewelry. But that was more than enough for her to live in state. From an essay investigating a literary hoax to new art responding to Trump's xenophobia, our editors share their favorites from the new issue! “To assert that Tove Jansson’s invention of the Moomin world may be partially rooted in ancient lore is, for this writer, to fear performing an act of sacrilege,” confesses Stephanie Sauer in her essay on renowned Finnish author-artist, Tove Jansson. This confession is the crux of Sauer’s questionings. Journey with Sauer from the moment the Moomins were conceived, to its unlikely, subversive evolution. Hold tighter still as she dives into Jansson’s personal life, her questions of war, artistry, womanhood, and sexuality, and the fearless, unconventional course she cut through history. 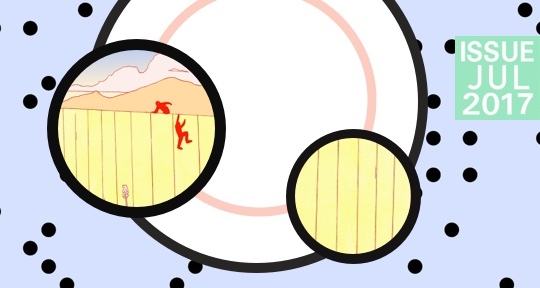 This issue features excerpts from two plays that deal with aspects of “disappearance” and surveillance. In Blanca Doménech’s The Sickness of Stone, translated from the Spanish by William Gregory, we take a look at a cold, dark world where random pieces of text read from discarded books become a kind of key to unlocking society’s ills or sickness. Gregory’s eloquent, tart translation finds the humor, bite and despair in this fascinating play. In Hanit Guli’s Orshina, translated from the Hebrew by Yaron Regev, a father must decide how he will disappear from his family’s life and what he will or will not tell them. An odd, compassionate family drama, Regev’s translation of Guli’s one-act is evocative and clear. Dominick Boyle talks to the winner of our 2017 Close Approximations contest (fiction category)! 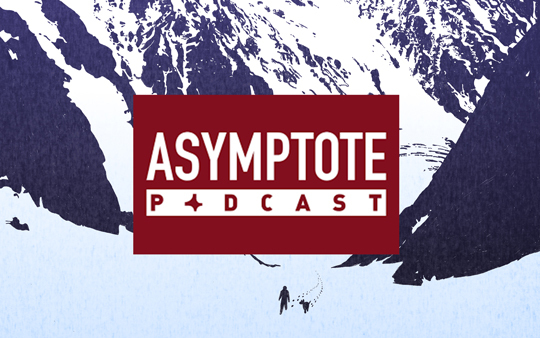 In this episode of the Asymptote Podcast we feature an interview with translator Suchitra Ramachandran. 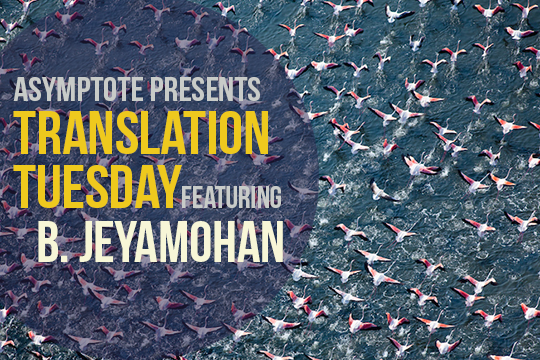 Her translation of the short story, Periyamma’s Words by B. Jeyamohan, won Asymptote‘s 2017 Close Approximations Prize in Fiction. Ramachandran and Podcast Editor Dominick Boyle delve into the rich world of language that the two main characters of Periyamma’s Words find themselves in, which is filled with symbolism that reaches epic proportions. Ramachandran says that this creates a text both incredibly challenging to translate, but also incredibly rewarding. They also discuss her own journey of linguistic discovery, which motivated her to become a translator. Frustrated by the inadequacy of Indian literature written in English to speak to her own experience, Ramachandran turned to literature in Tamil. Now, she hopes that translation can bring it to a wider audience. She says that translations of Tamil literature, surprisingly, are helping other Indians, and even native Tamil speakers, to discover the tremendous wealth of stories available in their own backyard. Music is “Divider” by Chris Zabriskie and “El Tranva” by Jenifer Avila. Used under a Creative Commons License from the Free Music Archive.